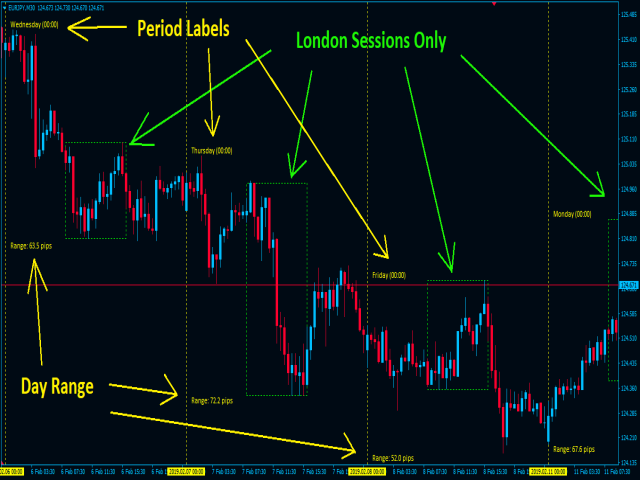 This indicator was designed to indicate trading sessions in a chart. 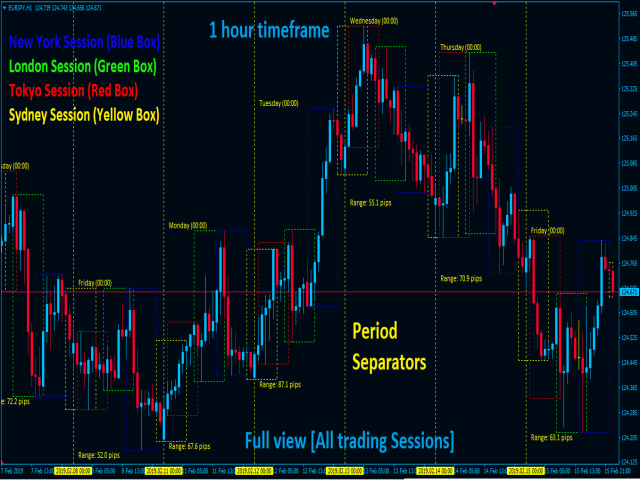 It draws boxes for each trading session in different colours. Some currencies are best traded during certain trading sessions. - EUR, GBP & CHF currencies have high volatility during London session. - USD & CAD currencies have high volatility during New York session. - AUD, NZD & JPY currencies have high volatility during Tokyo & Sydney sessions. 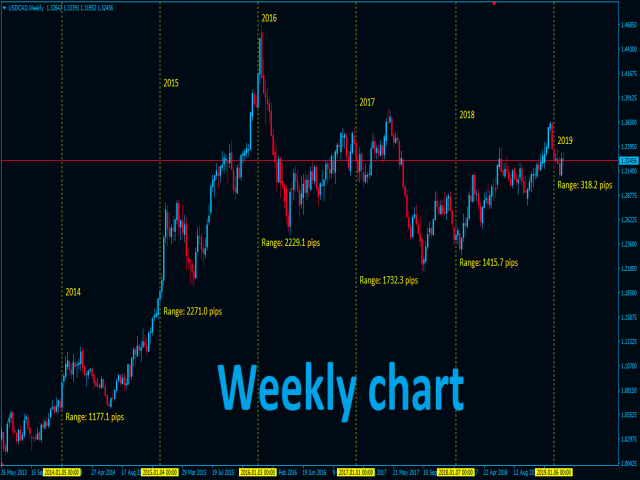 Example 1: If EURJPY pair did not trend during Tokyo session, then, it will trend during London session. 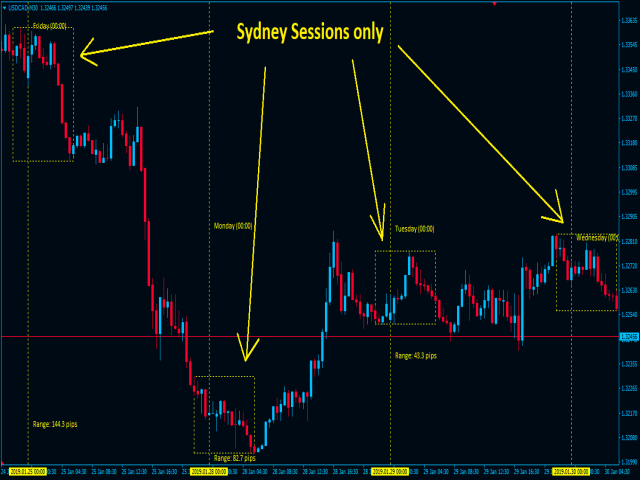 Example 2: If GBPAUD pair did not trend during Sydney session, then, it will trend during London session. 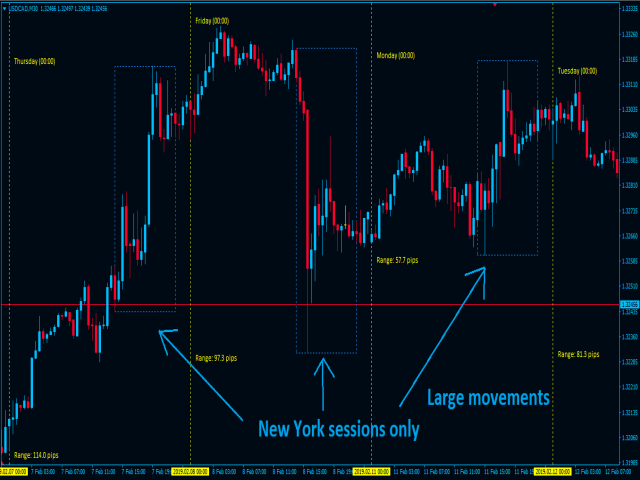 Example 3: If EURUSD pair did not trend during London session, then, it will trend during New York session. 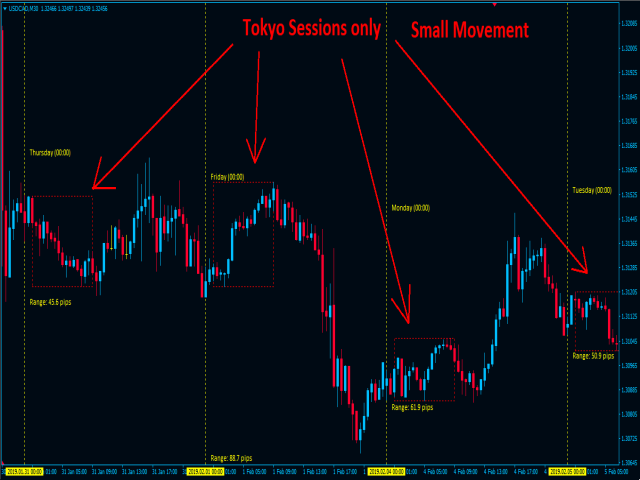 Example 4: If USDJPY pair did not trend during Tokyo session, then, it will trend during New York session. 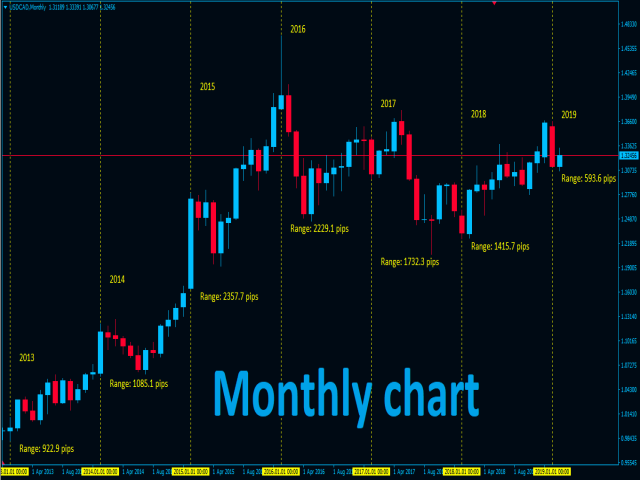 The indicator also has special period separators on all timeframes showing dates, year and time. 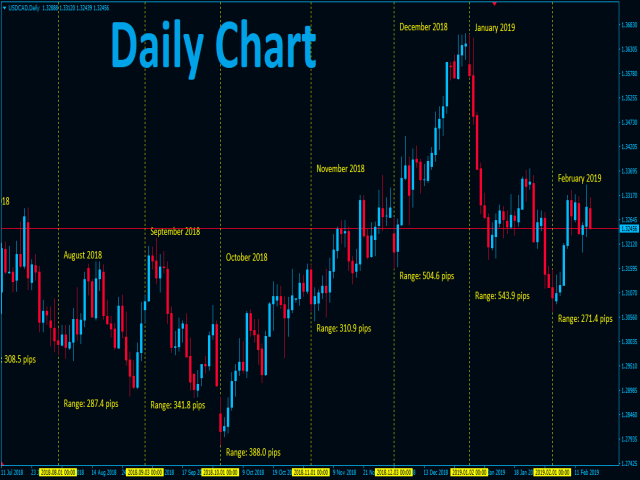 There are various options for higher timeframes. 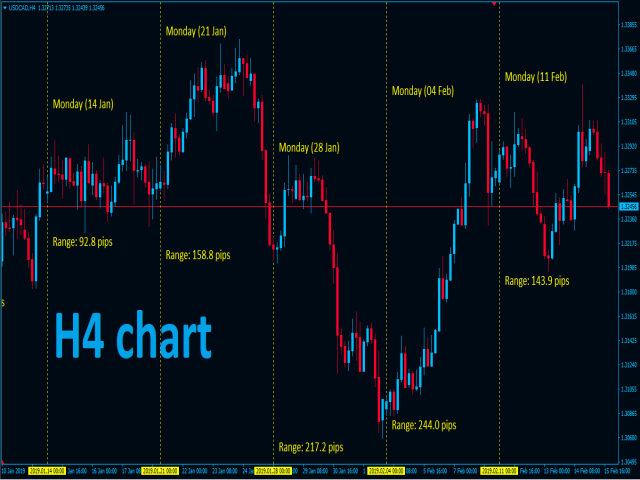 It calculates the range (in pips) of each period. 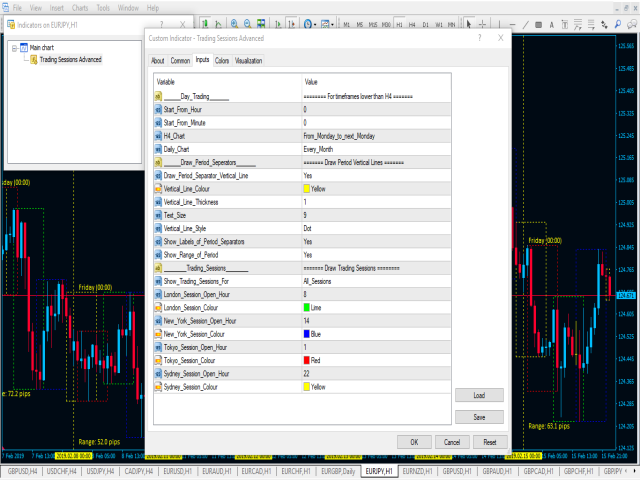 - During the Tokyo session, Trade JPY pairs (EURJPY, GBPJPY, CADJPY, USDJPY, CHFJPY, NZDJPY, AUDJPY). From_Hour - Choose the hour you want the indicator separate. From_Minute - Choose the minute you want the indicator separate. Show_Labels_For_Period_Separators - Show the labels (Days and time). Show_Range_For_Period - Displays the range for each period. Please note: All new products published in the market have a minimum price of 30 USD ($30.00). But, What I can do is give you 1000 activations so that you own this indicator forever!